Keith Haring was born on May 4, 1958 in Reading, where he was inspired to draw from an early age by Walt Disney cartoons and his father who was an amateur cartoonist. He moved to New York in the late 1970s to attend the School of Visual Arts, and soon immersed himself in the city’s graffiti culture. By the mid-1980s, he had befriended fellow artists Andy Warhol, Kenny Scharf, and Jean-Michel Basquiat. Diagnosed with HIV/AIDS in 1988, Haring’s prodigious career was brief, and he died of AIDS-related complications on February 16, 1990 at the age of 31. Before his death, Haring established the Keith Haring Foundation, a non-profit committed to raising awareness of the illness through art programing and community outreach. Before passing away Keith Haring started creating murals with awareness messages about AIDS. One of these famous murals is located in our beautiful city of Barcelona. Titled Todos juntos podemos parar el sida (Together we can stop AIDS). The original mural was painted in a poverty-stricken, seedy area in Raval known as the Barrio Chino. Haring chose a slanted wall in Plaça de Salvador Seguí, now the home of the Filmoteca de Catalunya. He was warned that this was one of the most dangerous areas of town, littered with needles, but he was attracted to it perhaps for that very reason, as he wanted to create a message about the dangers of drugs and AIDS. The Raval mural turned out not to be permanent. During a few years of its existence at its original location, it was severely tagged, scratched and disfigured. 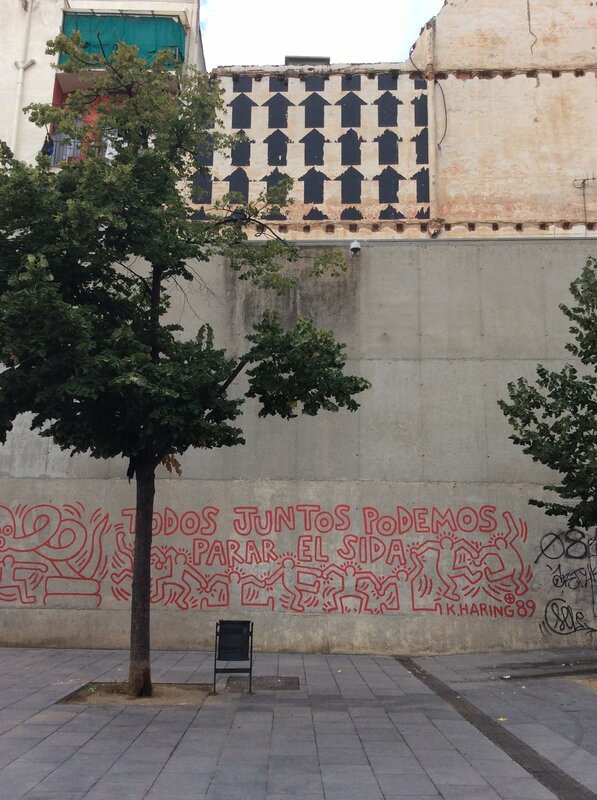 When the city decided to renovate Plaça de Salvador Seguí in 1992 as part of the ‘Special Plan for Interior Reform’ in the Raval, the mural was scheduled for demolition. The city council stepped in and asked the director and curator of the fledgling MACBA, Daniel Giralt Miracle and Antónia Maria Perelló, to evaluate its condition and present a proposal to somehow save it. When it became clear that the original could not be preserved, paint samples were taken from the wall by a conservation team, and a full-scale tracing of the mural was made for eventual transfer to another wall. The plan was approved by the heirs of the artist and restored to an outside wall of the MACBA (Barcelona Museum of Contemporary Art) located at the top of Raval. The mural depicts a syringe around which a large snake has coiled itself. The snake has the name AIDS. A couple in the shape of a pair of scissors cut up the reptile and another figure places a condom on its tail. It is painted in one colour, red, the colour of blood.